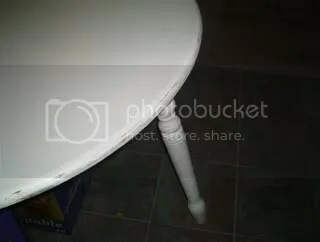 Well, Craigslist rocks again and we are picking up a table tomorrow morning that is a bit bigger, a lot sturdier, and better looking. And I can paint it up and make it fun. Last night the seller sent me a picture. This is the ONLY picture she sent. I think that if furniture could commit crimes, this is what their mugshots would look like. We’re buying it anyhow. We’re rescuing it from the clutches of poor photography.